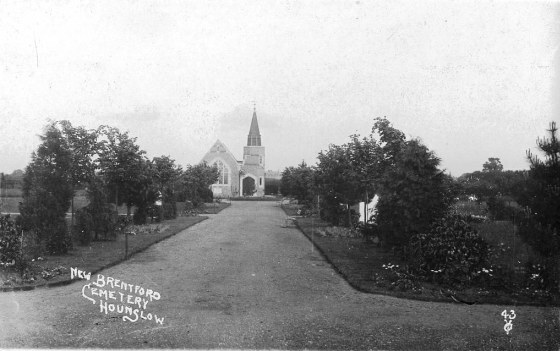 Howard Webb provided this postcard image published by Young & Co, showing New Brentford Cemetery, Sutton Lane, Hounslow. The original image is sepia. According to Gillian Clegg's 'Brentford Past' the first burial took place in June 1903. Prior to that burials took place in St Lawrence's churchyard (it was extended in 1884). The photo appears to have been taken shortly after the cemetery opened and I think it was taken from inside the Sutton Lane entrance. The image shows borders have been planted up and the trees look young. There is a tap to the left of the path and a couple of seats further on on the right. Google Earth provides a current day view, showing a heavily treed entry, the overhead view shows the layout of the cemetery and its paths. I also found close-up images of the chapel building. The London Borough of Hounslow website notes 'It has a small but delightful Chapel set amongst an avenue of Cedars and Pines'.